Fiber Flux: September CrochetCrate...Unboxing and Review! 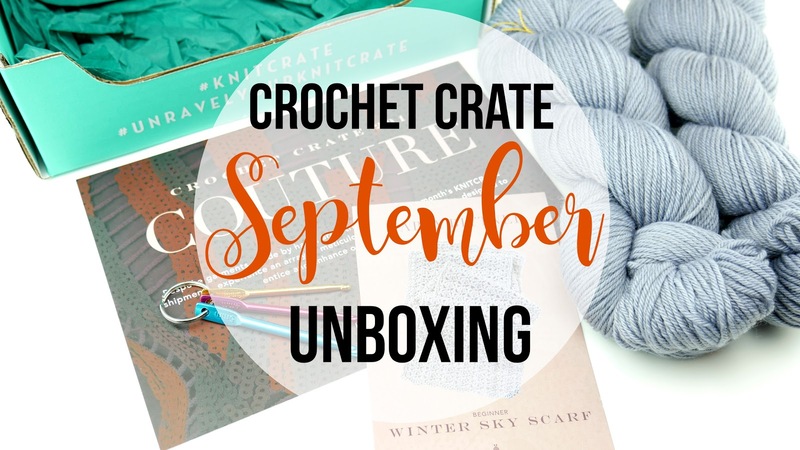 I am super excited to share with you the September CrochetCrate this month! Crochet lovers...did you know there's a crochet subscription box for crocheters only? The crochet version has been out for just a few months and I'm super excited to show you what it's all about! The CrochetCrate is a monthly subscription box that arrives right to your door. Each month it includes a fun crochet pattern, enough luxury/premium yarn to make the pattern at least once, PLUS a fun bonus item too! This can be a fun tool, a sweet treat, or a soothing luxury item to pamper. 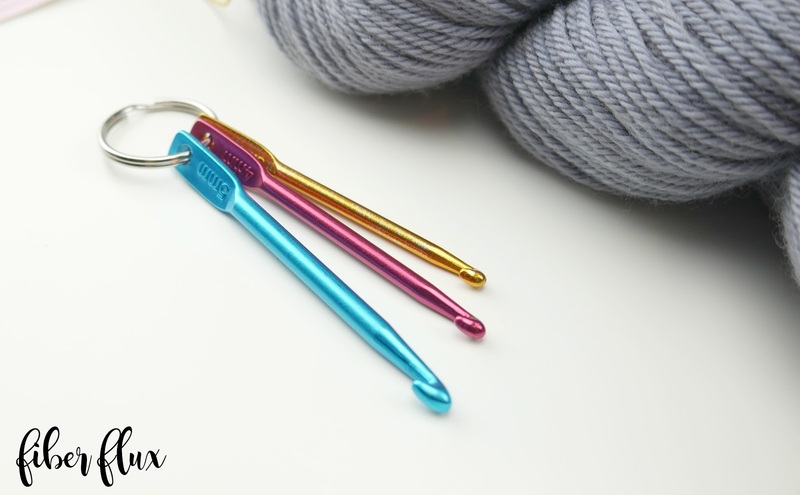 Here is the September bonus below, a fun and handy crochet hook keychain...so neat! 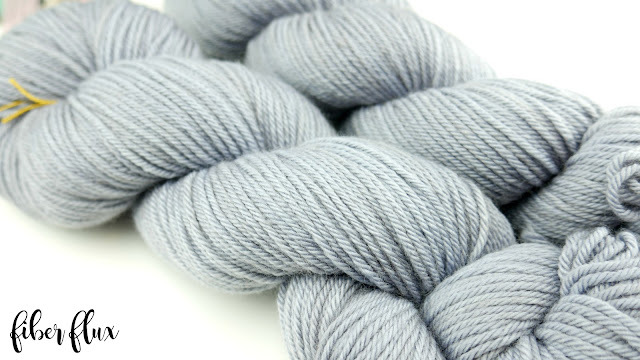 Close up of the yarn this month...how unbelievably cozy does that yarn look?! In addition there are promotional codes and you can earn points with every crate that you can collect to buy things in their online store too. Learn more about CrochetCrate here! KnitCrate, the makers of the CrochetCrate have generously offered Fiber Flux readers a special discount...save 20% off your first order using the code: FLUX20 (just enter it at time of purchase on their site). 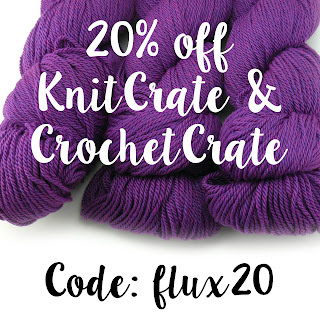 Special thanks to the folks at KnitCrate for giving Fiber Flux readers a coupon code! I received a CrochetCrate to review and share, all opinions are my own. Beautiful yarn, as always. That keychain would be a great tool for knitters, for picking up dropped stitches. Or for when you're out on the town and just happen to find a ball of yarn on the ground. Really happened to me once. There were no yarn shops around, and it was to nice of a yarn to have come from the nearby dollar store. I could tell it hadn't been there long, it was very clean and fluffy, so I took it. If I'd had that keychain I could have just jumped into action right then and there. Nice, crocheting has become a great hobby for many people and I'm glad you shared all these codes to save money. Crocheting has become a great way to take a break from mba engineering. Excited to try these codes out.